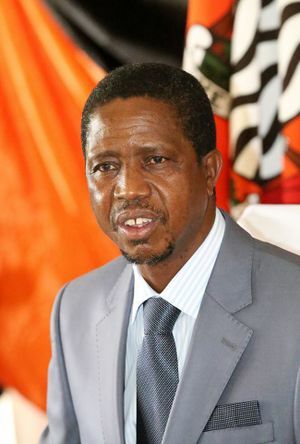 Edgar Chagwa Lungu (born 11 November 1956) has been the President of Zambia since January 2015. Under President Michael Sata, Lungu served as Minister of Justice and Minister of Defense. Following Sata's death in October 2014, Lungu was adopted as the candidate of Sata's party, the Patriotic Front, for the January 2015 presidential by-election. In the election, he narrowly defeated opposition candidate Hakainde Hichilema and took office on 25 January 2015. Lungu was born 11 November 1956 at Ndola Central Hospital. After graduating with a LL.B. in 1981 from University of Zambia, he joined the law firm Andre Masiye and Company in Lusaka. He subsequently underwent military officer training at Miltez in Kabwe under Zambia National Service (ZNS). He then returned to practising law. He then joined politics. He joined the United Party for National Development under the leadership of Anderson Mazoka, but later switched to the Patriotic Front (PF) led by party founder Michael Sata. After the PF won the 2011 election, Lungu became Junior Minister in the Vice President's office. He was subsequently promoted to Minister of Home Affairs on 9 July 2012. He became Minister of Defence on 24 December 2013 after Geoffrey Bwalya Mwamba resigned from his ministerial post, and he functioned as Acting President during President Sata's long term illness in 2013-14. He has also held a string of central positions in his party, including Chair of the PF Central Committee on Discipline, and he became PF Secretary General and Minister of Justice on 28 August 2014 to replace Wynter Kabimba, who was fired. These positions were in addition to the Defence portfolio. President Sata went abroad for medical treatment on 19 October 2014, leaving Lungu in charge of the country in his absence. Sata died on 28 October 2014. Vice President Guy Scott took over as Acting President, and Lungu was viewed as one of the main contenders to ultimately succeed Sata in a presidential by-election. On 3 November 2014, Acting President Scott dismissed Lungu as Secretary-General of the PF. He replaced him with Davis Mwila, the Member of Parliament for Chipili. However, the next day, on 4 November 2014, Scott announced Lungu was to remain as Secretary-General. On 30 November 2014, Lungu was elected as President of the Patriotic Front at a national convention of the party held in Kabwe, Zambia. However the convention was unusual because no voting took place. Instead, the unaccredited delegates elected him by raising hands. On 20 January 2015 Lungu contested the presidential by-election and beat his closest rival Hakainde Hichilema of the United Party for National Development by a narrow majority of just 27,757 votes (1.66%). He was declared the winner by the Electoral Commission of Zambia on 24 January. On 15 August 2016, he was declared the winner of the August 11 Elections and re-elected as President of Zambia after he polled 1, 860, 877 (50.3 %) and his closest river Hakainde Hichilema from the UPND polled 1, 760, 347 (47.8%). With the results from all the 156 constituencies, Lungu secured a Margin of 100,530, making him an outright winner and removing the Spectre of a Presidential Election Re-Run. 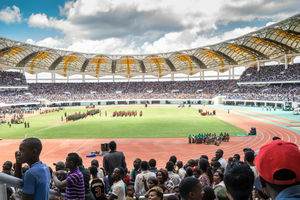 A cross section of the crowd at the 2015 inauguration ceremony in Lusaka. 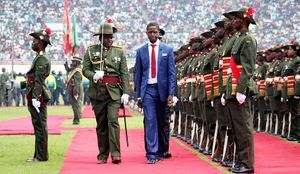 Lungu was sworn in as President of Zambia on 25 January 2015 at the National Heroes Stadium in the capital Lusaka. The following month, Lungu forced the head of the country's central bank out of office and promised lower interest rates. He appointed Inonge Wina as Zambia's first female Vice-President. In March 2015 Lungu collapsed while holding a speech commemorating International Women's Day in Lusaka. After spending a short while in a Zambian hospital he had an operation for his narrowed oesophagus in Pretoria, South Africa. Lungu commuted the death sentences of 332 prisoners to life in prison on 16 July 2015 and condemned the massive overcrowding at the Mukobeko Prison, calling it "an affront to basic human dignity". In October 2015, Lungu ordered a national day of prayer, to prevent further damage to his country's economy. Top religious and political officials participated, and other public events were cancelled. Lungu ran for a full term in the August 2016 presidential election, which turned out to be a rematch of the 2015 presidential election between Lungu and UPND candidate Hakainde Hichilema. Lungu won the election with 50.32% of the vote, just a few thousand votes over the threshold for avoiding a run-off. He also increased his margin of victory over Hichilema to 100,530 votes or 2.72%. Hichilema refused to concede defeat after the announcement of official results and filed a case before the Constitutional Court, asking for the results to be nullified due to irregularities. The court dismissed the case on 5 September 2016 and Lungu was inaugurated for a full five-year term of office on 13 September. Lungu is married to Esther and has six children. His daughter Tasila Lungu stood for councillor in Chawama constituency during the 2016 general elections. ↑ 8.0 8.1 Scott drops Edgar Lungu as PF Secretary General (article apparently moved), Lusaka Times, November 3, 2014. ↑ "Guy Scott reinstates Edgar Lungu as Secretary General until the burial", LusakaTimes, November 4, 2014. ↑ Matthew Hill,"Zambia Central Bank Chief Replaced as President Vows Lower Rates", Bloomberg, 13 February 2015. ↑ "Zambian president gives death row inmates life sentences", Reuters, 16 July 2015. ↑ "‘God have mercy on currency’: Zambia holds national prayer day to hold Kwacha from record drop", RT, 18 October 2015. This page was last edited on 19 January 2018, at 18:53.